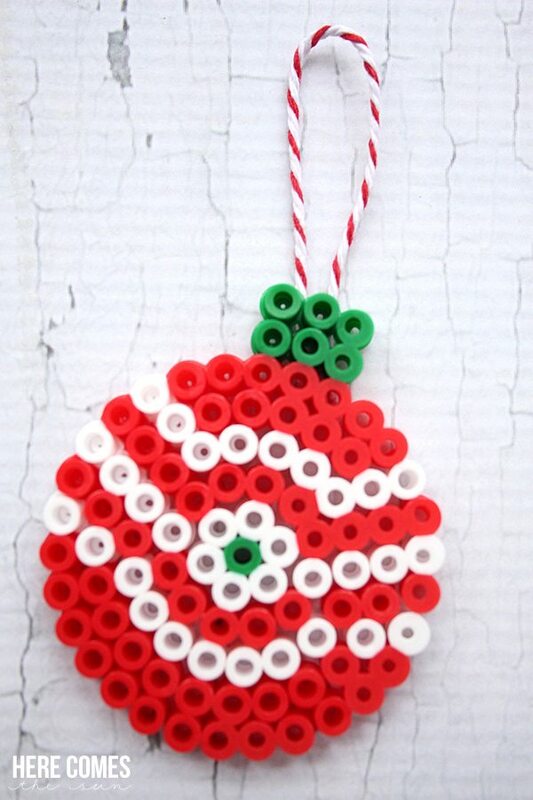 These perler bead Christmas ornaments are so pretty and easy to make. 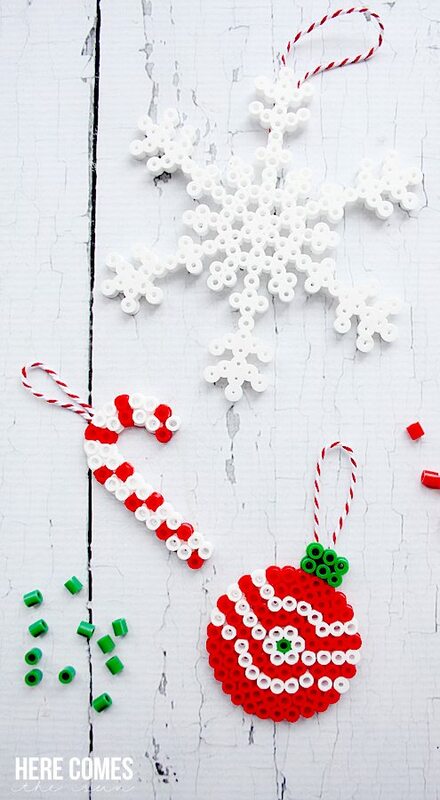 These are the perfect holiday craft for the whole family. I have a new obsession and it’s perler beads. I’m kinda shocked I haven’t used them until now. Each Christmas, I try to make at least one new ornament to add to our collection. 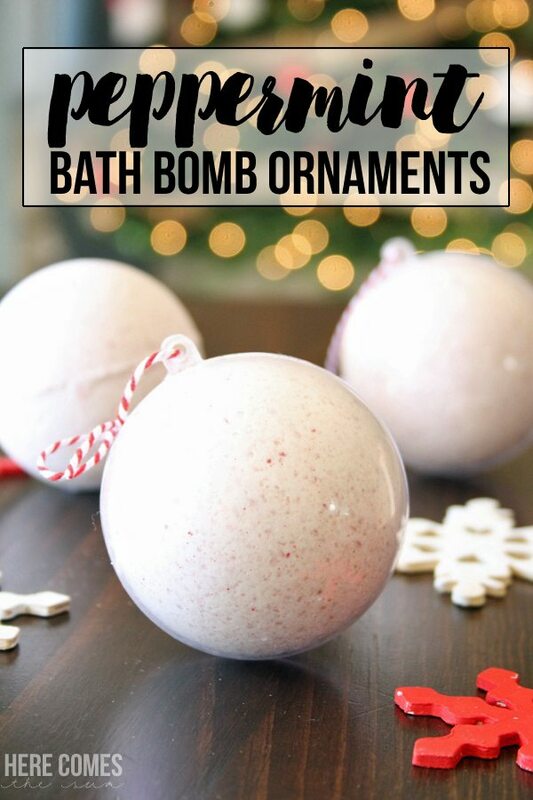 In the past, I’ve made snowflake ornaments, fingerprint ornaments, chalkboard ornaments and even bath bomb ornaments. This year I decided to get really colorful and creative and make perler bead Christmas ornaments. Have you ever used perler beads? They are so.much.fun. You can make pretty much any design that you can dream up. I printed out some easy designs and we all got to work. My son made a candy cane, I made a Christmas bauble and my daughter decided to make a snowflake. To make the perler bead Christmas ornaments, I first did a Google search for perler bead christmas ornament patterns. There are many that are offered for free. You don’t have to use a pattern but it does make it a little easier. Print out the pattern, and place it under the correct shape plate. Then place the perler beads onto the plate according to the pattern. The photo below doesn’t show the paper pattern but you get the idea. After you are done with your design, place a piece of parchment paper over the design and iron on medium heat for 10-20 seconds. Let your design cool and then peel off the parchment paper and take your design off of the plate. Turn your ornament over and iron the back. 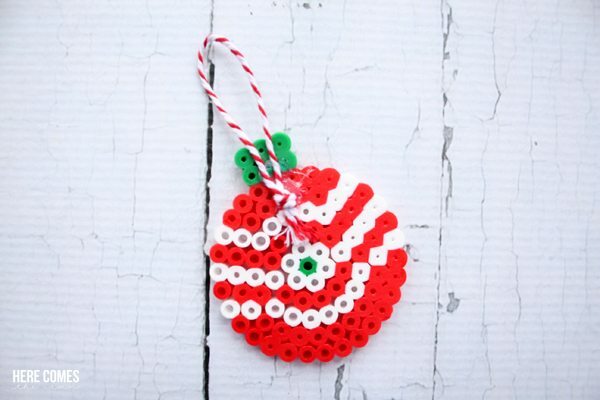 Cut a piece of bakers twine, form a loop and hot glue to the back of the ornament. Don’t press down too hard on the beads or they will all mush together and your design will look like a blob of color instead of individual beads. It will take a bit of time to get all the beads to properly fuse. Only put heat on the beads for 10-20 seconds at a time. Then check to see if all are fused. If not, repeat with heat for 10-20 more seconds. I’m in love with our new ornaments and the kids can’t wait to put them on the tree.